If using the starter culture, place 1⁄2 cup of water in a glass measuring cup and add the culture and stir until dissolved. Let the mixture sit while you prepare the carrots — anywhere between 5 and 15 minutes. If using kefir whey, add it when the recipe calls for culture in step 4. Peel the carrots and cut them on the diagonal in ½ " pieces. Place the carrots, garlic, jalapeno, bay leaf, peppercorns, and salt in a 1-quart glass or ceramic container that can be securely sealed. 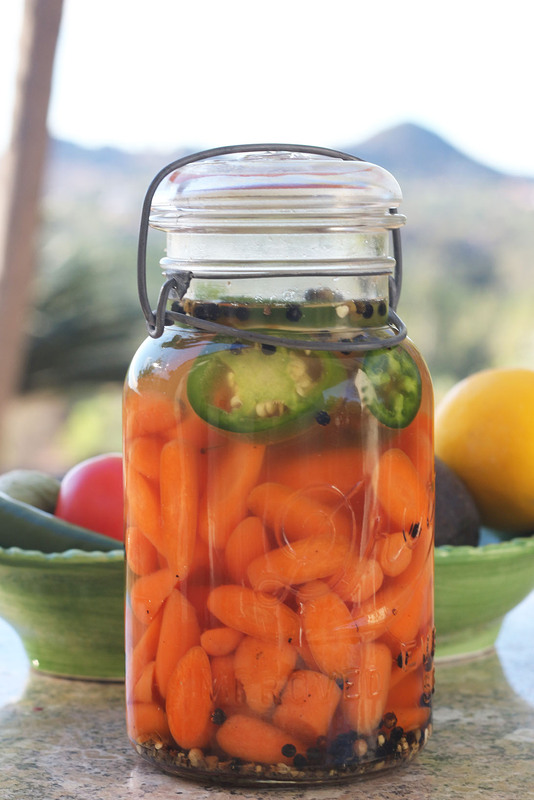 Add the culture and fill the container with filtered water, leaving 2 inches of headspace to let the carrots bubble and expand as they ferment. Seal the container and let it sit on your kitchen counter, out of direct sunlight, for 3 days. Check the carrots every day to make sure they are fully submerged in the water. If they have risen above the water, simply push them down so they are fully covered by the water. If any white Kahm yeast formed because the carrots rose above the water, do not worry. Remember, this isn’t harmful. Just scoop out the moldy carrots and push the rest back under the water. After 3 days, place the carrots in the refrigerator. 2 Responses to "Mexican Carrots"
Hi, once open a packet of culture starter, how long does the remainder last for or do I need to use it all straight away? Thanks. It last quite a while at least 6 months in the fridge.